I don't know. I'm considering doing a series on great games that are generally overlooked. I decided that, if I'm going to start anywhere, I'll start with the Langrisser series. So what is this Langrisser series? Langrisser started as a little known strategy RPG for the Genesis. Although the first one was later released in the States as Warsong (which a few of you might know), there have been no further attempts to bring any of the games in this series Westward, which is a real shame. Basically, Langrisser is something of a hybrid between games like Advance Wars and Military Madness and games like Shining Force and Fire Emblem. You begin a scenario, move and attack with units, use special abilities, and try to defeat the enemy. The game is based on a square grid, and units can be attacked from four directions directly adjacent to their location. In latter games, ranged combat is also possible from further away. Finally, the game is based, to some extent, on a rock/paper/scissors-esque structure. Infantry beats pikemen, which beat cavalry, which beat infantry. In the original, archers fill the role of pikemen, but, in later games, they are a sort of weak ranged element that add a new strategic layer. There are also units that are better/worse on water, units that can fly, long-range units (ballistae in later installments), and plenty of others. 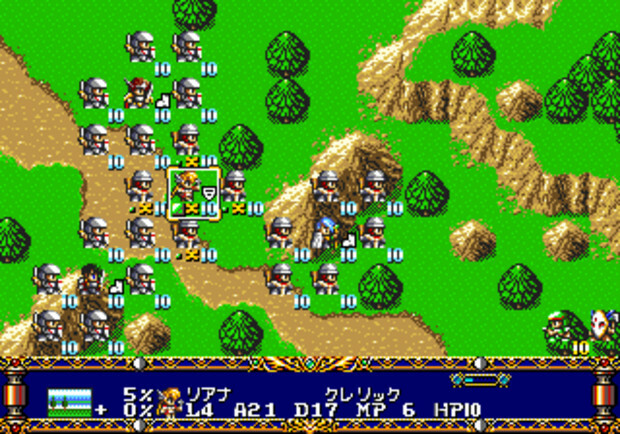 In terms of HP and basic setup, Langrisser is actually more like Advance Wars/Military Madness than its RPG brethren. Each unit has 10 hitpoints, and units' ability to inflict damage is based on attack/defense values and a variety of modifiers, such as terrain, abilities, unit type(s), etc. Most of this should be fairly familiar especially to fans of Military Madness and Advance Wars. 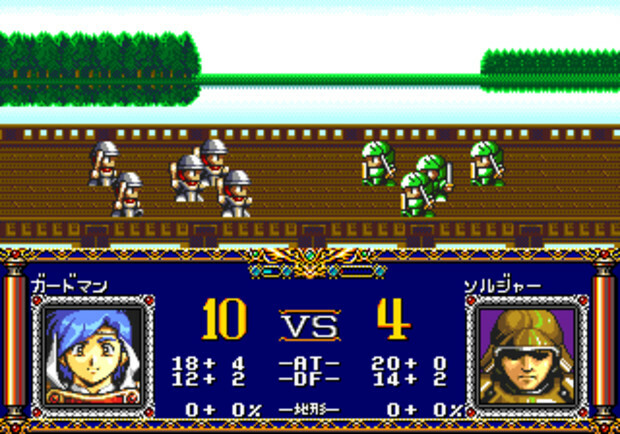 The picture above shows the scene that plays when two units engage in a fight. Look familiar, Advance Wars/Military Madness fans? Additionally, some of the more RPG...ish elements from Shining Force/etc. are gone. 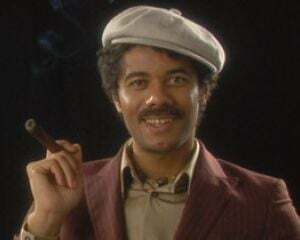 You can't go to towns. You can't talk to people. The story (especially for the earlier games in the series) is more or less linear. However, Langrisser also shares elements with its RPG brethren. For example, your generals gain experience by defeating enemies. After gaining 10 levels, they can develop into a new class, which is selected via a branching class system. Although you should generally stick to more traditional routes, this gives you some flexibility to try out new classes and strategies. You can make healers into mages, mages into knights, and knights into flyers, etc. etc. You can always find new weapons on the battlefield or from victories, and you can be new weapons and items at menu-based shops that you can access between levels. Even though you don't have towns to visit, these shops do add some interesting stuff to an otherwise boring game. Overall, the level progression system, with its class elements, and the item system do make the game feel significantly more like an RPG (and add to the sense of progress). Certain classes also have access to spells, which tend to act more like spells a la FF Tactics/Shining Force than abilities in Advance Wars. The story is also virtually ripped from the.. textblocks of the standard RPGs of its era. Especially with the first few installments, the story is a basic medieval setting where "evil wants MacGuffin, and you save the day." However, the presentation tends to be generally good, and the story has a way of growing on you even with all of its trite nonsense. Especially in latter installments, the story begins to open up a little bit and explore the motivations of the characters. Langrisser II/Der Langrisser, in particular, shows the primary villains in a positive light. In Der Langrisser, you can even join the villains, either to support evil, to further your own goals, or to actually do the right thing (!). However, none of the above really gets at what makes Langrisser special. Thus far, it would probably seem like the game is pretty typical for its genre. However, what makes the game different is that, well, there are two different kinds of units: generals and mercenaries. Generals are your character units: these are the guys that can gain levels, wear equipment, and change classes. They also are the ones with special abilities and storylines. Mercenaries are hired to work for your generals. Generals can only hire certain mercenaries based on their strengths. For example, a Knight can hire cavalry but not pikemen. Lords can hire pikemen, but not crusaders. Priests can hire crusaders, but neither cavalry nor pikemen. Also, depending on the general, they can only hire a set -number- of mercenaries. This is partially driven by class, but it can also depend on other progression elements as well. In other words, a weaker commander might only be able to hire 3 units, while a stronger might hire 5-6. Once you're actually in the battle, these units stick to your general. If you use some sort of autocontrol (which, trust me, will save plenty of wasted time), they will automatically move with and protect your general with certain formations. More importantly, if they are in their general's zone of influence, they will gain the specific bonus that general yields to his or her units. Again, both the size of this zone of influence and the size of the bonus are based on the specific general and the specific class. Weaker generals will barely impact their mercs, while stronger generals will have a larger impact over a sizable area. Additionally, this effect is split into an attack and a defensive bonus. This means that certain commanders will do better on the offensive, while others will do better at holding ground. Additionally, if a commander is killed, all of his or her mercs disappear. These elements add a whole new level to the tactics, as you need to maintain formation, keep your units together, and take advantage of splits in the enemy force. However, more importantly, this all serves to make the battles feel FAR larger than in other games in the genre, as well as genuinely allow for control over territory. When you have a line of pikemen blocking a pass from a cavalry charge, it's actually a -full- line of men. Behind this line you can have healers, wizards, archers, and artillery all hammering the enemy forces and maintaining your defensive formation. It all feels very satisfying, and I honestly can't go back and play other SRPG's after enjoying the Langrisser games. Overall, next to FF Tactics, the Langrisser series is probably my favorite series of Tactical RPGs. I hope that, somehow, we see some return to its style of gameplay, as the license is largely dead and buried. Most highly recommended: Langrisser I for either Genesis or PC, Langrisser II for Genesis, Der Langrisser for SNES. Largely avoid Langrisser III, as it's more of a Dragon Force ripoff. Langrisser IV is currently being translated, so watch for it. More information: http://elsallia.com/ - Mostly dead but some people on the forum. There is just a wealth of info. on that site regardless.